The hardest part of my breast cancer journey was my double mastectomy. What began as my 2nd surgery in a series of 3 surgeries, turned into the 2nd of 6, soon to be 7 surgeries. It’s been a long journey! Therefore I will be covering it over a series of posts. This post pertains to the actual mastectomy itself and my subsequent hospital stay. 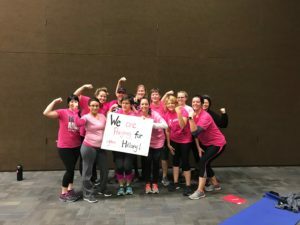 Before I dive into the details of my mastectomy, I want to say this – having a double mastectomy was one of the hardest things I have ever done. I know that is relative and based upon my limited experiences. So here is what I have for comparison – childbirth and half-marathons. I delivered 3 babies naturally. 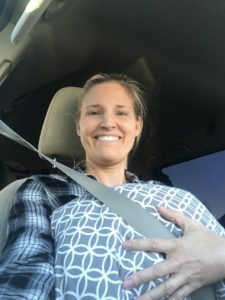 Natural childbirth is both physically and mentally challenging. Labor has a set duration. However trying childbirth may be, all that quickly fades the moment of relief when new life miraculously enters the world. Training for and running half-marathons is also physically and mentally challenging. You push through the pain. You reach a certain point when you are exhausted, and you will yourself to keep going. Like childbirth though, its duration is limited. Its duration is also fairly predictable based upon your training. 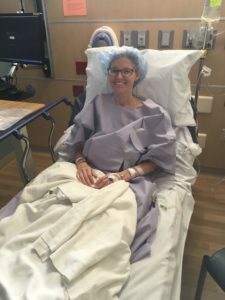 My double mastectomy recovery was both physically and mentally challenging. I wondered when the pain would subside. The intensity matched childbirth, but that period of intense pain lasted much longer. I found myself longing for the relieve of delivery in childbirth. Like running a half-marathon you have a mental battle, hoping relief is coming. It did, but it took weeks. Back to my forced “Mommy Makeover” as I quip. 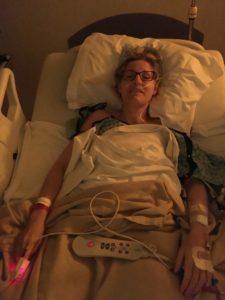 My double mastectomy was scheduled first thing on a Friday morning. With the typical food restriction of nothing 12 hours before surgery, I like being the first surgery of the day. Sure you must arrive at the hospital in the wee hours, but you get to sleep during your “no eating” window. Plus I don’t typically awake hungry. The night prior and the morning of the surgery, I was required to shower and use two small bottles of special antiseptic soap to cleanse my chest and the surrounding areas. After my shower I was instructed to use a fresh laundered towel and clothes. All these precautions in an effort to decrease the likelihood of infection. Before I got dressed, I took some photos for the last time of my natural breasts. That may sound odd, but honestly, I wish I had taken photos before my lumpectomy now too. Fake breasts aren’t the same. It’s oddly comforting to be able to look back, reminisce and compare. 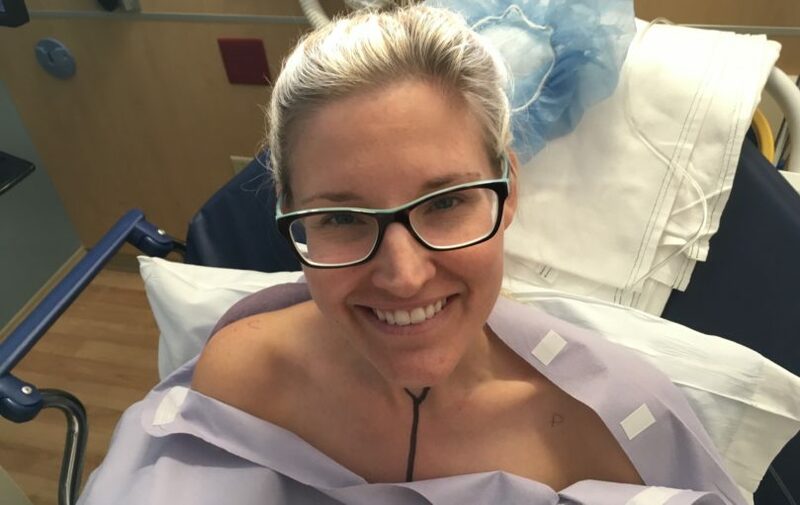 If you are facing a double mastectomy with reconstruction, I recommend taking lots of photos – before, during and after. With a bra and without. The photos help during the process, or at least they did me. Seeing my progress was encouraging. I had to arrive at the hospital at 5:30 am. 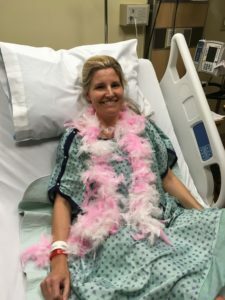 Unlike my lumpectomy, my mastectomy was inpatient. It required a two-day post-opp hospital stay. My surgeon said the hospital stay was to assure my pain was under control. Once at the hospital, I waited briefly before being called back. My husband was not allowed to accompany me back until I was all prepped for surgery. I was in pre-opp alone for about an hour. During that time I listened to music on my iPhone. Well, actually I listened to one song on repeat (a habit that drives my husband crazy). The song? “Feel Invincible” by Skillet. It became my official “get pumped for surgery song.” If you haven’t heard it before – listen to it. If it doesn’t get you pumped, I don’t know what will. I thought it was especially fitting knowing I had a tough road ahead. As I waited I also texted updates to Eric. One of my friends send me a series of photos via text. I had been working out with her at P31 fitness. She coordinated having three P31 classes pose with a sign. 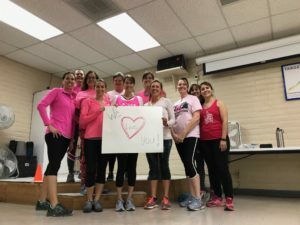 Most of the women were sporting pink. I was really touched by this coordinated effort and their thoughtfulness. During recovery I revisited these photos. 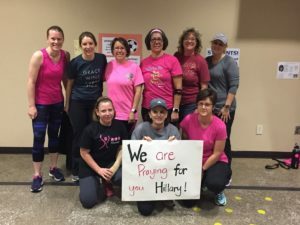 They were a huge encouragement! When my husband was allowed back, he was accompanied by some friends from church. My friend Rebecca and her husband Chris, a pastor at our church. We exchanged hugs. Chris and Rebecca prayed for the surgery and the surgeons. After our prayer, we visited until we were interrupted by the arrival of my plastic surgeon. He greeted everyone and told me he needed to make some markings on my chest. Our friends decided that was their cue to leave. They gave me hugs and wished me well. My plastic surgeon asked me to stand up. Standing he unfastened the shoulders of my gown. With a medical sharpie he drew lines where he wanted my breast surgeon to make her incisions. Since I had chosen hidden scars these lines were under the natural crease of my breasts – inframammary incisions. He also drew a “v” along the top of my sternum and a vertical line down the center of my chest. He said good-bye and told us he would return when it was his turn in surgery. The nurse verified his contact info and asked him when he would like to be contacted to return for surgery. When my breast surgeon stopped by, she verbally confirmed which breast was cancerous. Then she wrote a “c” on my corresponding shoulder. She wrote a “p” on my other shoulder for prophylactic (preventative). The anesthesiologist told me the surgery was too long for my anesthesia of choice – twilight. My double mastectomy and reconstruction would take between 6 and 7 hours. He encouraged me that I would be less nauseous with IV anesthesia than gas. I was also given a scopolamine patch behind my ear for nausea. When the OR nurse and anesthesiologist came for me, I gave Eric a hug and a kiss goodbye. I remember being transported to the OR, but my pre-surgery memories end in the OR. I awoke in recovery to a bustling nurse tending to a patient in the bed beside me. She noticed I was awake, acknowledged me and finished with the patient who departed shortly thereafter. I remember very little of my interactions in recovery. My most vivid memory was the pain. That and the nurses quietly cheering when a patient departed who I assume must have been particularly challenging. Shortly after I awoke, I was transported to a hospital room. I remember being alone in my hospital room, but without any concept of time. My husband eventually joined me in a flustered state. No one had told him I had been transported to a room. He was frustrated he had been waiting in the OR waiting room when he could have been with me. I was assigned a medical assistant and a nurse at the hospital. When my medical assistant came in for the first time, I told her I needed to use the restroom. She said I could not get out of bed without assistance. She raised the head of the bed. I was instructed to swing my legs over the side. She put her arms under mine and around my back and pulled me up as I tried to stand. The whole motion was incredibly painful. In fact I would describe it as violent and abrupt. As I stood, I became incredibly dizzy and nauseated. She helped me to the restroom and onto the toilet. Nothing. Have you ever had the sensation that you need to urinate really badly, but you can’t? I sat and tried, but to no avail. She finally helped me back into bed. I was told I had been given a catheter during my surgery due to its duration and sometimes the bladder has a hard time “waking up” after that. Catheter #1 post-surgery. The next time I felt I needed to use the bathroom, the nurse responded to my call. She helped me out of bed and what a difference! My husband and I both commented how much smoother transitioning out of bed was with her. I mentioned how rough and painful it had been with the medical assistant. My nurse told me she would help me out of bed from then on. The medical assistant was no longer allowed to help me. Despite my best efforts, still no luck. Catheter #2. Each time I responded she nodded her head and said good. It was odd, but I answered her questions. I still had an intense urge to urinate but couldn’t. Catheter #3. After she left, I commented to Eric how odd that was. Not with the night I had. He said they struggled to wake me during the night. When I was awake, I had no idea who I was or if I had kids. Apparently, all I talked about were polar bears. Another Rainman moment. My kids had recently received a national geographic kids’ magazine about, you guessed it – Polar Bears! My husband was exhausted. Witnessing how out of it I was made Eric nervous. He stayed awake all night zealously watching over me. Fearful I might stop breathing. Back to the catheters. Between the nurse and medical assistant I was given 3 catheters before my surgeon was made aware of the problem. She told them to stop. If they needed to catheter me again, leave it in. Luckily, the next time I needed to use the restroom I was finally able to urinate. I have never been more relieved and excited to use the bathroom in my life! Who knew that could be an issue post-surgery?! After she left, I mentioned this to my husband. He informed me that I did not recall the interactions the night before. She had been in my room with the nurse when they were struggling to wake me. My husband said the nurse and the medical assistant fought the entire time. He didn’t get into details, but in his mind the apology was warranted. Her behavior had not been professional. I was told by my breast surgeon the goal of the post-surgery hospital stay was to get my pain to a manageable state. She said that should take about two days. Sometime during my first full day at the hospital, my pain medication was switched from an IV to oral medication, a step closer to going home. Honestly though, I was in an incredible amount of pain. On a scale of 1 to 10, hands down a 10! The meds didn’t seem to me like they were making a difference. Aside from pain management, I also had surgical drains. These needed to be cleaned and drained three times a day. I know. Gross!! Right?! The medical staff helped teach us how to do this. In a nasty, berating and belittling tone she went off on my husband about how homeless people like to stay as long as possible in the hospital. Let me just be clear here – we are not homeless. Eric stayed surprisingly calm and did not respond to her tirade. 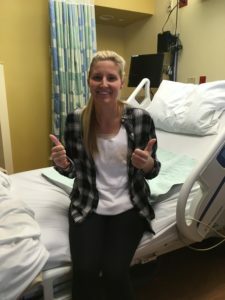 When she was done, she thanked him for being “seemingly normal.” Luckily, the administrator and the medical assistant were the extent of our negative experiences in the hospital. That night my husband told me he needed sleep. We arranged for a friend to stay with me until another family friend could arrive to stay with me over-night. I was exhausted and in a lot of pain. The next morning I was asked to rate my pain on a scale of 1 to 10. Still a 10. The solution? My surgeon called in a stronger pain medication prescription from the pharmacy at the hospital. That way I could be discharged that day with the medication in hand. I already had oxycodone, but this new painkiller was even stronger than that. Both my breast surgeon and my plastic surgeon visited me before I was discharged. They came in almost back-to-back. The first surgeon to visit removed the bandages. Before the second surgeon came in to check on me and rewrap my chest, I was left sitting there with my chest exposed. It gave me a moment to access the damage. Nothing can quite prepare you to see your chest post-mastectomy. My skin was black and blue. My expanders were empty, so my chest was completely flat, but my skin did not lay flat. Imagine a deflated balloon. Drains protruding from either side. I asked my husband to take a photo. I know, weird, but trust me the photos are encouraging later. Seeing where you have been is encouraging when you aren’t where you would like to be yet. Don’t worry, I won’t ever share those types of photos. 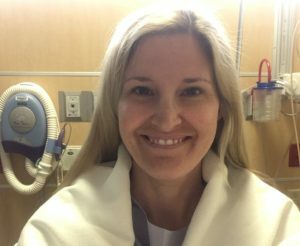 As I prepared for discharge, I was brought a mastectomy tank top. It contained pockets to hold my drains (think of a sweatshirt with a pocket for hands in the middle). The tank top also had removable padded inserts to give the appearance of breasts. Eric immediately said they looked silky and removed them. He put them under his shirt and jokingly walked around before throwing them away. It was nice to laugh, but painful. He helped me dress. In retrospect there was a point weeks down the road when I would have liked to have them to feel “normal” again, but no big deal. Without the padding the tank top fit loser. Considering how much pain I was in, I appreciated that. Total side note, but how do you get into a tank top when you can’t lift your arms over your head? You step into it and pull it up. There you have it, my camisole hack. I put on camisoles for months by stepping into them. When we were all ready to leave Eric was instructed to pull the van up in front of the hospital. Side note, but having our van was an intentional choice. Getting into a van requires no bending over. Knowing I would have limited mobility, we though it would ease my transition. It did. 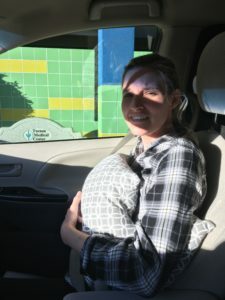 Getting in and out of a car post-mastectomy is painful.